How Hardy is Thuja Green Giant? Heavy snow falls have already happened – and well into the south, where they are much rarer. We can guarantee that right now there are gardeners staring at hedges that have been damaged – either a little, or seriously – by that snow, and other gardeners looking in trepidation at their hedges, wondering if all those years of care are about to be undone. So let’s consider what, if anything, can be done to help a damaged hedge recover, and what to do next time,or in anticipation of future damage. Help – the Snow Smashed my Hedge! Let’s start with the worst-case situation, your hedge is looking caved in, and you can see broken branches – it looks really bad. The first step is to pull as much snow as you can off the hedge, and then give it a little time to see how much it bounces back. As anyone who has shoveled a driveway knows, snow is heavy stuff, and when it lodges in the branches of your hedge it really pulls on it, so that you might be seeing sections that have caved in, or branches pulled out of the hedge. A rake or broom is the best way to remove the snow and try not to tear more at any branches while you do it. This is easiest to do when the snow is fresh, so once you have the driveway and paths cleaned, turn your attention to your hedge. 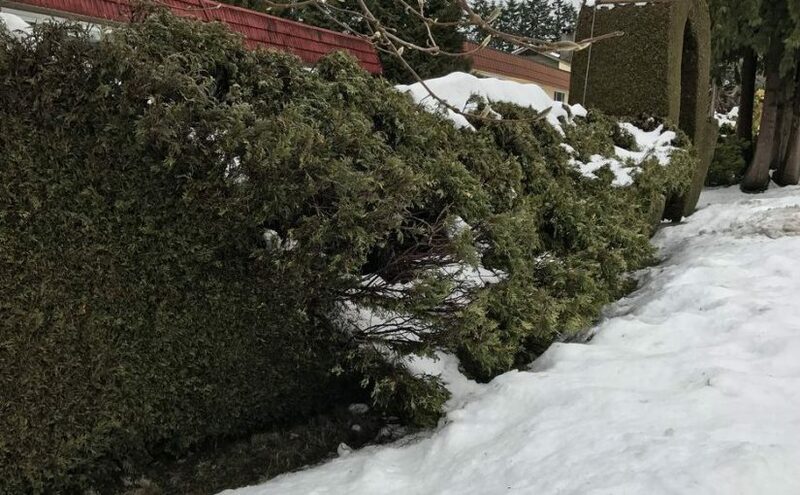 Along the top of a hedge is a spot where you will often see a big buildup, and even if your hedge is not damaged, removing some snow before it turns to ice, and remains in place, only to be added to be the next fall, is a good thing to do too, even if you have no damage visible. Now you need to wait, and really, there is not much point in doing anything until spring, when all the snow has melted, and no more is expected. If your hedge is old, and there is a significant amount of damage,then almost certainly the best course of action is to remove it all and replant.If you choose a fast-growing hedge plant you will be looking at a good hedge is just a few years, so don’t feel too saddened. Some people try cutting back, but this simply doesn’t work,and is a waste of effort. It will work fine for a broadleaf evergreen hedging plant, like holly, privet or laurel, and also for a few conifer evergreens,notable yew (Taxus). These plants can re-sprout from old stems, and often they will regenerate themselves in just one or two seasons. But for plants like cypress, arborvitae, juniper, and even our old friend Thuja Green Giant, re-sprouting is not going to happen. These plants are unable to produce new growth from stems that don’t already have green parts.Cutting back to stumps or hoping that broken branch that is leaving a giant hole will re-sprout, is never going to work – really, it isn’t. If the damage is limited to branches being pulled out of the hedge, but not broken, things are much more hopeful. These can often be tied back to other branches, and once new growth begins, and you have had one or two trimmings, everything will probably look fine. A word of warning though – never tie ropes tightly around the stems of hedge plants, or any other plants for that matter. As the stem grows the rope will cut into them, and in a few years everything above the rope will die. Always use open loops, with plenty of room left in them. Threading a section of hosepipe onto the rope, to cradle the stem, is a good idea too, or movement of a rope under tension can cut into the bark. But My Neighbors Hedge is Fine! This is perhaps the most annoying thing of all – the same snow storm, and your hedge is flattened, while next door everything looks perfect. There will be some good reasons for this, and if you are now going to plant a replacement hedge, here is how to reduce enormously your chances of losing that one too in a few years. Start trimming while the hedge is young. Many people make the mistake of waiting until their hedge is fully grown, before starting to trim. This creates a weakly-structured hedge, which can easily break and fall apart. Instead, begin almost immediately to remove an inch or two regularly. If you do that your hedge develops lots of internal branches, giving it has a dense structure that resists breakage. Trim in fall. A neat,smooth hedge will not hold snow, but a rough one, with lots of tufts and branches sticking out, certainly will. That last trim in early fall, leaving enough time for a small amount of new growth, makes for a hedge that will shed the snow from it sides, and won’t accumulate much at all. Look around and you will see that it is almost always the untidy, untrimmed hedges that break apart during a heavy snow storm. Slope the sides inwards.This has lots of other benefits, but for snow protection it keeps the top as narrow as possible, so that snow is more likely to be shed and fall to the ground,rather than build up on top. As well, it keeps the lower parts healthy and green, and discourages your hedge from growing big and fat on top – a sure-fire recipe for winter snow disaster. Keep the top rounded.While a square-cut top might look very formal and elegant, a rounded top is much safer. Keep it as narrow as possible too. This can often mean getting around the other side and trimming the top from there too, but the point is to achieve a narrow top that has rounded edges. This creates a flowing surface that encourages the snow to fall off, rather than build up. And now for the plug! If you do have to replace that hedge,consider using Thuja Green Giant this time around. Proven to be the fastest hedging evergreen available, your new hedge will be ready in just a few years,and with its resistance to deer, drought, salt and diseases, Thuja Green Giant is going to be a great hedge for years to come, especially if you follow these tips to reduce the risk of snow damage this time around.